Curtain air bags are located along both sides of the roof rails above the front and rear doors. They are designed to help protect the heads of the front seat occupants and the rear outboard seat occupants in certain side impact collisions. 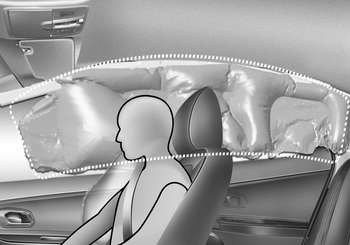 The curtain air bags are designed to deploy during certain side impact collisions, depending on the crash severity, angle, speed and point of impact. 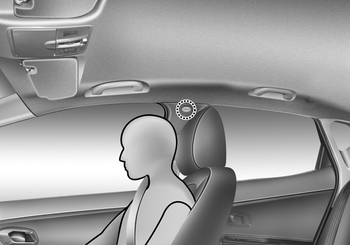 The curtain air bags are not designed to deploy in all side impact situations, collisions from the front or rear of the vehicle or in most rollover situations. Do not hang heavy items on the coat hooks for safety reasons. In order for side impact and curtain air bags to provide the best protection, both front seat occupants and both outboard rear occupants should sit in an upright position with the seat belts properly fastened. Importantly, children should sit in a proper child restraint system in the rear seat. When children are seated in the rear outboard seats, they must be seated in the proper child restraint system. Make sure to put the child restraint system as far away from the door side as possible, and secure the child restraint system in a locked position. Never try to open or repair any components of the side curtain air bag system. We recommend that the system be serviced by an authorized Kia dealer. Do not place any objects over the air bag. Also, do not attach any objects around the area the air bag inflates such as the door, side door glass, front and rear pillar, roof side rail. Do not hang hard or breakable objects on the clothes hanger.